Some weeks ago, I released a few copies of The Well into the wild as Bookcrossing ‘travelling books’. The idea’s a simple one – you leave a book lying around for others to read and then pass on when they’ve finished. The book has stickers in it,which ask that people log its progress on the Bookcrossing website. In the case of The Well, I also asked if people would take a picture of themselves with the book – if they did, I said I’d post it on my website. Well, here’s the first one. This is reader Nicola Heaney, who posted this picture on her Facebook page. 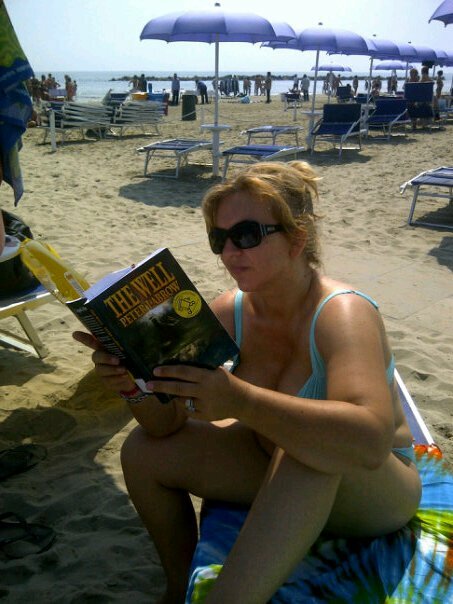 She’s currently reading The Well while relaxing near the Adriatic Sea, near Rimini in Italy. She’s promised to take a picture of herself with the book in Rome, before passing it on. Any pictures of people with a copy of The Well (a Bookcrossing copy or not) will be posted here if people send them to me. This entry was posted on Saturday, June 4th, 2011 at 4:50 pm	and posted in Reading. You can follow any responses to this entry through the RSS 2.0 feed.